Altitude range. 1100-1400(-1700) metres above sea level. Habitat and ecology: This species is restricted to the Chihuahuan Desert where it grows in dry slopes or hills and low desert plains on rocky bank among bushes: On volcanic or alluvial, sandy or clayey black alluvial plains. The climate is dry. This species is threatened by modification, fragmentation and destruction of habitat by clearing, fires and changing the use of the land. M. brunnea reproduces vegetatively by rhizome outbreaks. 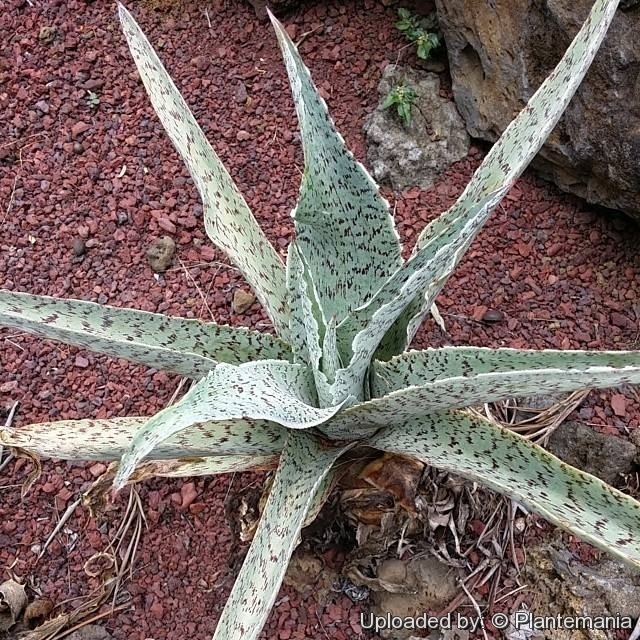 Description: Manfreda brunnea, also known as Agave brunnea, is one of the most attractive manfredas. Plants are often solitary, acaulesscent, with a single rosette sprouting from the large bulb. Slow-growing and compact. The rather broad, succulent, channeled leaves are glaucous with fine terra-cotta speckling, and emerge in the spring (or may be evergreen in cultivation). The dark, brownish flowers (hence brunnea) outlined in yellow make for an elegant display. It was first collected in July, 1888, by Mr. C. G. Pringle, on the battlefield of Buena Vista, Coahuila, Mexico—fortunately, he and his find survived as the infamous battle occurred in 1847 during the Mexican-American War. Bulb: The plant has an underground stem erect and much shortened 2-4 cm long, 0.9-2.5 cm in diameter and surrounded by the crowded leaf-bases to form a tunicate bulb. Roots. The roots are fleshy. Leaves: Few, forming a flattened basal rosette, thickish, 10(-20) cm long, 1-2(-4) cm, linear-lanceolate to wide-lanceolate, broad near the middle, channeled, recurved, apex acute, succulent-herbaceous, neither rigid nor sclerified, finely pubescent, smooth, grey-green, somewhat glaucous with fine reddish speckling. Margin more or less wavy, with a thin pale band, teeth small, cartilaginous, very spaced apart. Remnants of basal leaves fibrous. leaves, the upper part abruptly smaller. Flowers: Sessile. Corolla yellowish green on the outside or brownish maroon inside, outlined in yellow, variable even within the same population, 3 to 3.5 cm long. The lobes are about half as long as the narrow tube with pointe and outlined by a plume of hairs at apex. Tube funnel shaped longer than the ovary. Ovary 12-20(-23) mm long. Stamens and style long-exserted. Style equal to or longer than filaments. Stigma club-shaped deeply grooved. Tepals inserted into the distal 1/4 of the tube, yellow. Fruits: 1.8-3.6 cm long, 1.2-1.9 cm in diameter, ellipsoids to oblong, woody with a short point. Phenology: This species flowers from June to August and fruits in October. Seeds: 0.5 x 0.3-0.4 cm, black. Cultivation and Propagation: Manfreda brunnea are summer growing plants that go dormant in winter, they restart to grow in spring, as long as they are planted in a well-drained spot where winter rains will not rot the roots. Definitely requires a dry winter-early spring rest. Soil: Well-drained soils are best for this drought-tolerant rock garden or container plants. Hardiness: This species is native to areas from south-central Texas to the Gulf of Mexico. There is no apparent reason that these plants should be able to withstand the degree of cold that they have proved they can. However, if soil drains well and plants are in a sunny position, they are dependably hardy in zone 5 -28°C if they are planted early in the growing season after all chances of frost. Use: This desert perennial is a great accent to garden borders, rock or container gardens. Manfreda's are drought tolerant in the ground once established. They can tolerate poor soils or are great for containers. Traditional medicine: Crushed leaves used to draw out the poison from snake and insect bites; crushed leaves applied to mumps, swellings of joints and carbuncles. Propagation: M. brunnea reproduces only vegetatively by rhizome outbreaks hence most of the plants on the trade comes from tissue culture. Use a succulent potting mix enriched with leaf-mould and turf, just be sure to give it good drainage. And unlike many more-tender succulents, you don’t need protection from the sun.